If you have been following the training schedule, you are two-thirds of the way to race day on Sunday, April 9. From week eight to week nine, training transitions from strength endurance to speed endurance. 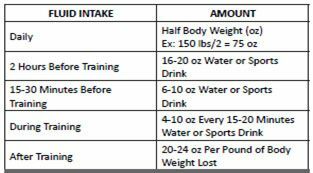 Refer to the table below to make sure you are taking in the recommended amount of fluids. Monday: Swim 800 yards – 6 x 50 (moderate effort) with a 25- second recovery between sets, then 5 x 100 yards with a focus on form, and 25- second recovery between sets. Wednesday: Bike eight miles moderate pace, flat to rolling hills, keeping cadence at 90 RPM. Thursday: Core: 10 minutes anytime during the day: 4 x 30 second planks, 2 x 25 modified crunches. Friday: Run four miles at a moderate pace. 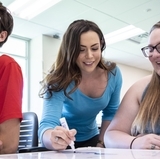 Early-bird registration and student discounts end on March 17. Sign up today. UNM Hospital employees contact Byron Piatt, bpiatt@salud.unm.edu or Lori Peterkin, lpeterkin@salud.unm.edu for UNMH discount code. 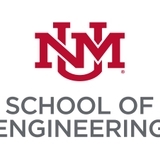 UNM faculty and staff may use tuition remission for the coaching sessions, which include race registration fees. Register at Lobo Staff. The Lobo Triathlon is organized by HESS (Health Exercise and Sports Sciences), a department in the College of Education. All proceeds benefit the Summer Youth Sports Program.